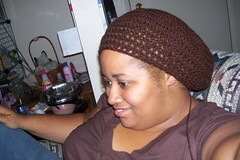 I made this brimmed slouchy hat last night. I wanted something that i could wear that would fit over my hair. 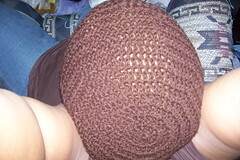 I'm not completely happy with the brim,but I think I'll make a couple more and tweak the brim. but here it is. here's what it looks like without the brim. I like it this way too. If you have massive tons of hair (for example really long locked hair) you might want to add in multiples of row 10 and it will make the hat more oblong to fit your hair. Ok, you can start with a joined chain or with a magic circle. I like the magic circle personally, but its up to you. 15. Ch 3. 1dc in next stitch and each stitch around. 16. Ch3. dc in next 9 stitches. Decrease. B *1 dc in next 10 stitches. Decrease* repeat from *to* around. join. fasten off. Brim starts here! If you stop here it’ll look more like a giant snood/hairnet. I double stranded the brim to make it stiffer. If you don’t want to you can probably not fasten it off on row 16 and start the brim from there with a ch1. If you read ahead, you can see where I was just making up the brim as I went along. You can choose to use whatever stitches you want for the brim but I think the basic concepts still gonna work about the same. Next time I’m gonna do all my dc rows before I start in on my sc’ed rows. As is, I was just trying to make the brim, look visually how I wanted to. I had to go back and count afterwards. If/when I fine tune the brim, I'll come back and repost it. 1. Join yarn in any stitch on the edge of hat. Slip stitch in same stitch. sc, hdc, dc in next 20 stitches (more if you want the brim to be wider) hdc,sc, slip stitch. Turn. 4. ch1. sc in slip stitch and each stitch across ending in slip stitch. Turn. 5. ch1. sc hdc dc across row. In last 2 stitches of row (hdc, sc) turn. 6. ch1. sc across row. 7. ch1. 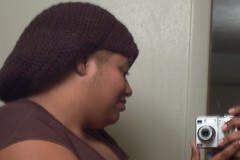 sc around entire hat (brim and all) fasten off and weave in the ends. I love that, as always with your stuff. What yarn did you use? It's brown Red Heart. I have to go back tonight and figure out wha tI did, cause i knew what I wanted and I jsut sorta made it up as I went along. I really wanted the back to be super long. I'll post a tute for you as soon as I have one. That's really awesome! Love the brim! Being surly is my superpower. Tenille, your projects are always so cute, you're adorable, and you always make me smile! Of course tattoos hurt...they're applied with needles, not kitten whiskers and bunny tails. Thanks Tenille, I certainly can wait. I hope I wasn't the annoying tute begging type! The Lil Hippies are taking over! I love the hat! It's something I would totally wear, and am actually in the midst of making. P.S. - Your chair matches my couch. Eco-friendly items, patterns, hippies, and more. Looks beautiful. I love how slouchy it is and the brim looks really nice. cute hat Tenille, way to go! I like this style- it reminds me of some that I've made from the Hip Hats and Cool Caps book. You crochet pretty quick, it seems like you always have some new projects to post. ditto here!! !- you inspire me!! Slytherin by choice, Griffindor at heart. This is perfect! 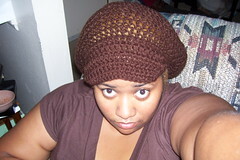 I have a friend at work that wanted a hat just like this for her super long dreads. Pretty Please post a tute, if you can! You crochet pretty quick, it seems like you always have some new projects to post. you sure are wicked with a hook! Your hat looks GREAT! Super job! Ok, I modified the 1st post and added in the pattern. Sorry it took so long. Feel free to PM me if the pattern isn't as clear as I thought. 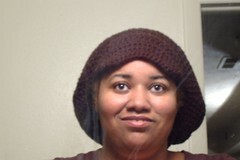 I tried this pattern today, and unfortunately my hat wound up looking all funky. Instead of the body of the hat being round, it's all lumpy looking. I included a picture, but I took it with my cell phone so it's a pretty awful shot. I'm not sure how this got so botched, but I'm thinking maybe the gauge of the needle or the weight of the yarn? I think I followed the pattern properly. Any thoughts? check out my handmade goods on etsy! Thanks. I'll give that a shot and see what happens. When I made the first one, I just winged it. If you can make a hat you can do this easy. 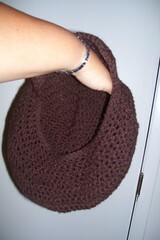 Just pick a big hook and start out like your making a regular hat, just keep incresing until it's bigger than normal. It should pretty much lay in a giant flat circle until you stop the increases. When you start the 1dc in each around that'll make it loosely bowl shaped. and the decreases make it actually fit. Feel free to shoot me a pm if you have any questions. Newbie newbie newbie. lol Thats me. Always a good choice to crochet before cleaning! hehe Love it!